It’s been forever and a half since I thought out loud with the lovely Amanda! 1) I am never not surprised that it’s almost May. What the heck!? 2) Last week was the “Easter Octave”, which means that the Church celebrated Easter for eight days straight, since the joy of the Resurrection cannot be contained within one single day. Let me tell you, I celebrated. With lots of alleluias and just as many desserts (I definitely had two desserts on several days). thanks for the cute cookie, Megan! Sometimes I went for a slightly more nutritious dessert, but nevertheless, I let loose with my sweet tooth. 3) The day after the Boston Marathon, I went on a beautiful run with my two beautiful friends, Kelsey and Sarah. You all know I’m not a huge fan of running, but my body didn’t want to do any sort of strength/HIIT or even yoga, so I asked Kels and Sarah if I could run with them after Mass on Tuesday evening. 3) I didn’t sign up for a half marathon, but my friend Ben and I did sign up for a Spartan Sprint Race!!! We talked about it on Marathon Monday and decided it would be a fun thing to do this summer. I’ve always wanted to do an obstacle course race for fun, so the time has come! The Spartan Sprint Race is a 3-5 mile course with 20+ obstacles. Although I want to be relatively in shape for the race, I’m not really changing anything about how I work out right now. 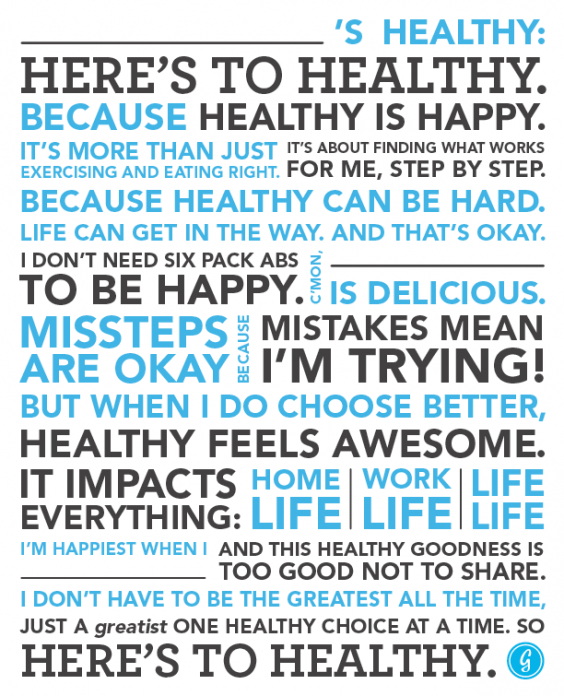 My mind and body are happy with my 4-ish workouts per week, varying based on how I feel that day. 4) It’s strawberry season/the grocery store has strawberries on sale! 5) Last weekend was filled with so much a cappella, and I wouldn’t have had it any other way. My talented friends Adrienne and Connor each had their last a cappella concerts of their college careers, and they were both phenomenal. Our whole Catholic Center fam came out to support like proud (and very loud) relatives. Adrienne and Connor, you guys are amazing! 6) I am officially in finals mode now (even though classes end next Wednesday). I am finished with regular exams and now just have one research paper for religion & medicine, a final for health policy, and a final for gross anatomy. Nighttime study sessions are all the rage these days. 7) Should it be warmer than 60*F at this point in the spring? Boston will have one day per week when the temperature exceeds 70, but the rest of the days are still pretty chilly. I don’t even know what normal temperatures are anymore (going from Ireland ➔ Florida ➔ NY ➔ Boston in less than two months). There have been some gorgeous days, though, as you can see. I do like the mild weather too, so I guess I shouldn’t complain before the heat hits. 8) I feel like I haven’t been cooking as much in the apartment recently, but when I do, it always feels like I’m trying to use up as many leftovers/things in the pantry as possible. It’s never too shabby though! 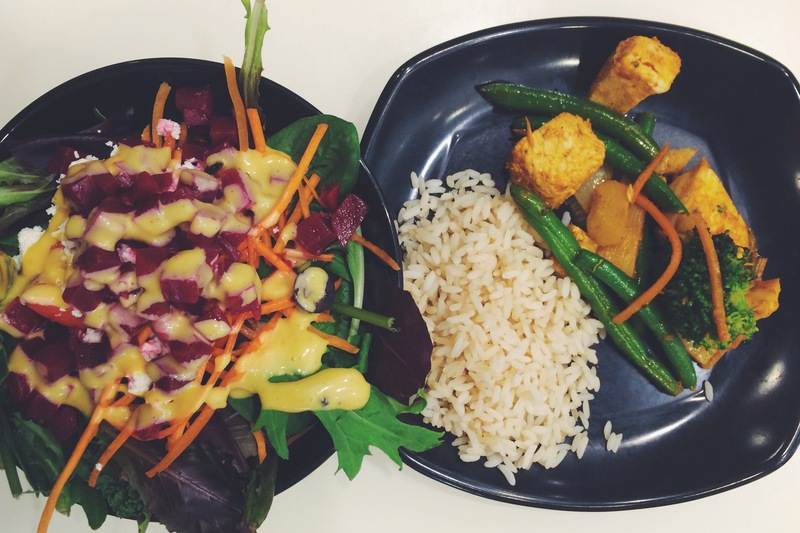 9) Campus dining has had some pretty good hits too. 10) This week was filled with a lot of goodness, but I also had rough patches. I realized that I always try to emerge from trials a little more perfect than before (which isn’t bad in and of itself — God calls us to be perfected in Him), but I end up discouraged and even surprised when I find myself in the same weak and confused state that [I thought] I had overcome before. I needed to re-learn that, even when I feel confused, weak, or like a failure: a) it’s okay to feel that way, because I am a weak human being; b) I don’t have to try to fix myself before asking others/God for help to be better. I can’t fix myself once and for all. That would be trying to dodge this thing called life. Hope you all have a great Thursday! Which in-season produce are you excited for? Two fun things you did this past week! Click the button to check out the mastermind behind Thinking Out Loud! 1) A great moment of judgement from others: When I’m walking through the dining hall wearing my athletic head band, athletic clothes, and athletic iPhone armband all while proudly holding a plate of dessert. 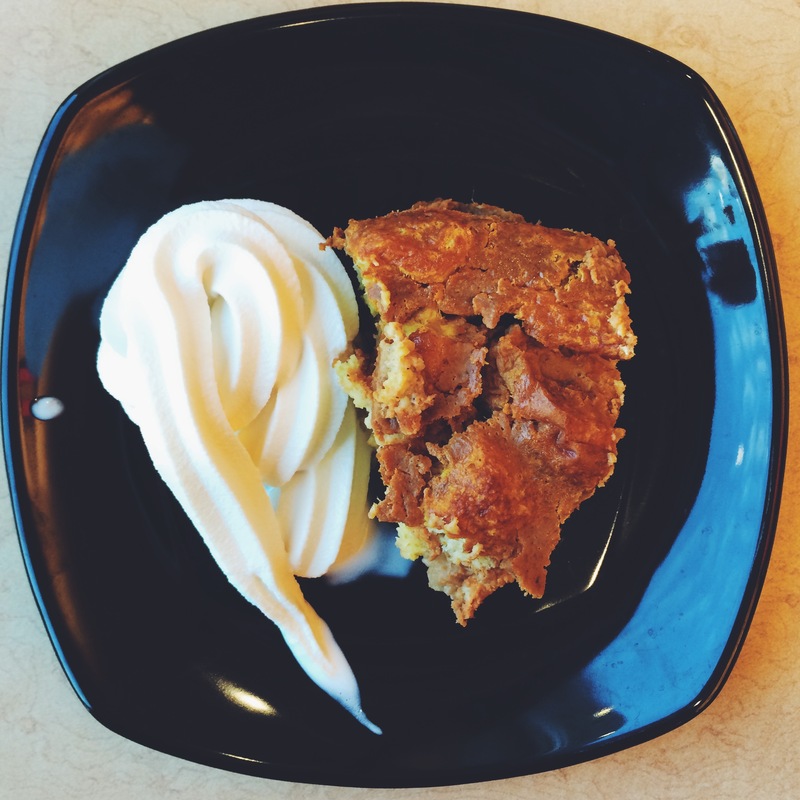 But if you tasted this pumpkin bread pudding [a la mode], you would have #NoRagrets too. 2) My current favorite salad dressing is CREAMY. Creamy honey mustard dressing, to be exact. I’m not a huge fan of other creamy dressings such as caesar, ranch, thousand island, etc., but honey mustard has a special place in my heart. 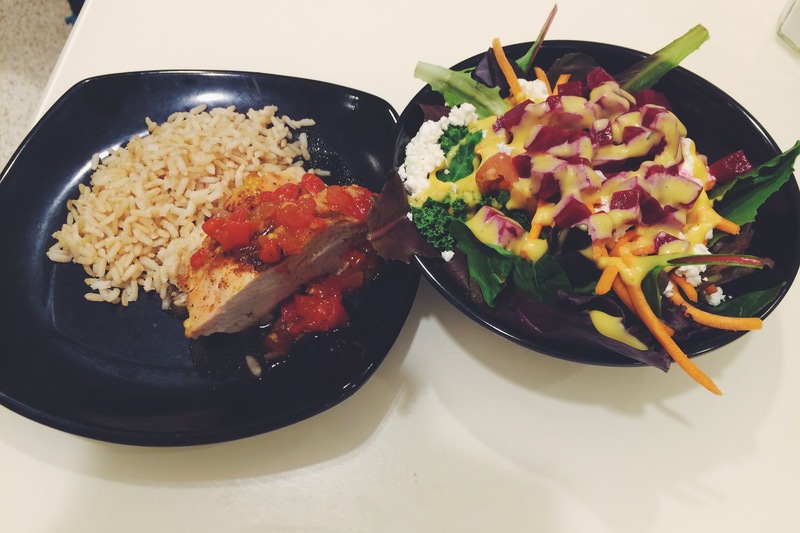 Side note: The chicken in each of these meals was on point—flavorful and not a workout to chew it. 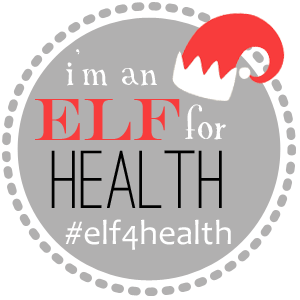 3) I have not done steady state cardio training (as in, running, elliptical, rowing, stair master, etc. for a longer duration) in several months now, and out of all the types of exercise I used to do, I definitely miss this the least (if at all). In fact, I don’t think I could enjoy doing it ever again. 4) I’d much rather get my heart rate up with burpees or dancing, and I’d rather build my endurance with something like hiking or bouldering (<— stuff is no joke). One of the great things I’ve truly internalized after taking time off of formal workouts this summer is that it’s not worth it to continue exercise that you don’t enjoy. 6) I cracked open and ate a whole lobster all by myself for the first time last night! 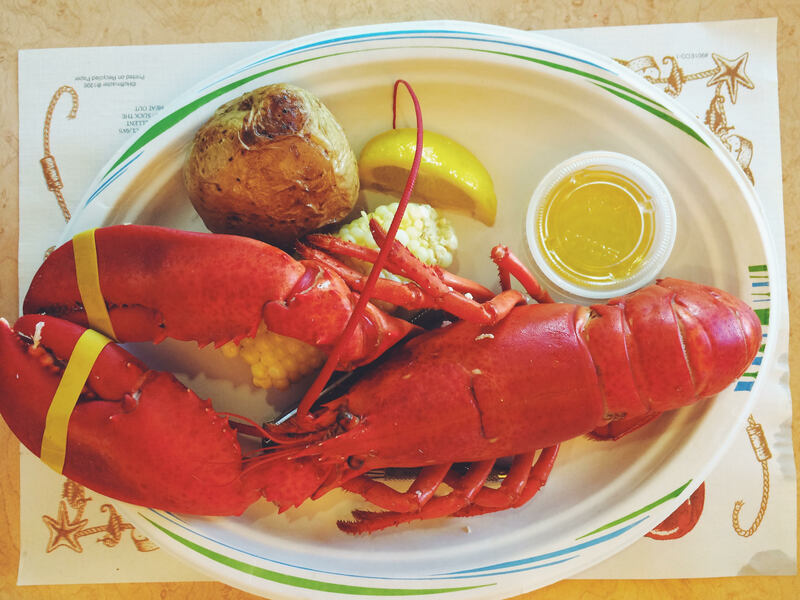 Once every year, the BU dining halls have lobster lobstah night, and since I missed it last year, I made sure to join the festivities this year. It was madness in the d-halls, but it was worth it for this little bugger. 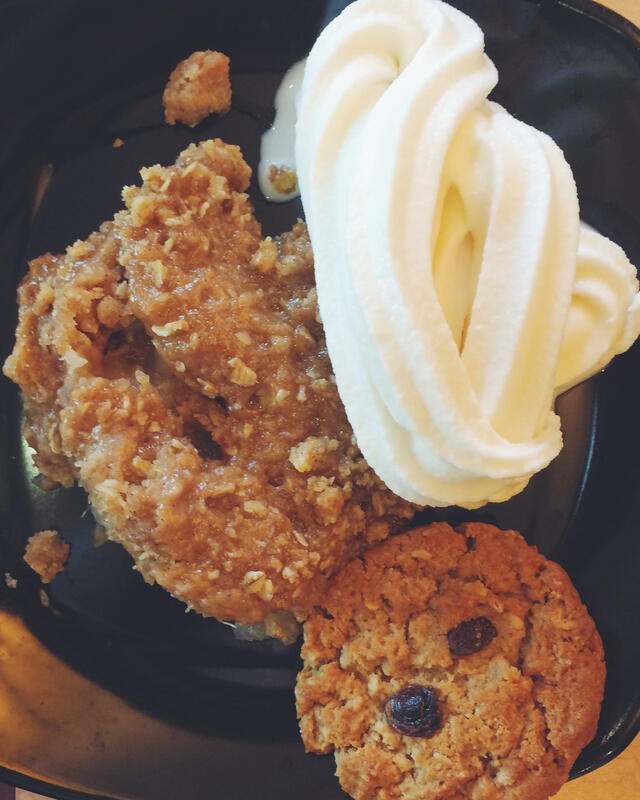 Especially followed by this local macintosh apple crisp + oatmeal raisin cookie a la mode. 8) I cannot begin to tell you how much I’m loving modern dance class. Even though I’m not planning on pursuing dance professionally, I think I’ve realized that I want to keep dance a part of my life forever. Dance = soul speaking (<— such artist language). 9) If you have a Snapchat… What the heck are those new filters!? Like, those things are straight out of nightmares and horror movies. I just know I’m going to have trust issues opening snaps from now on. 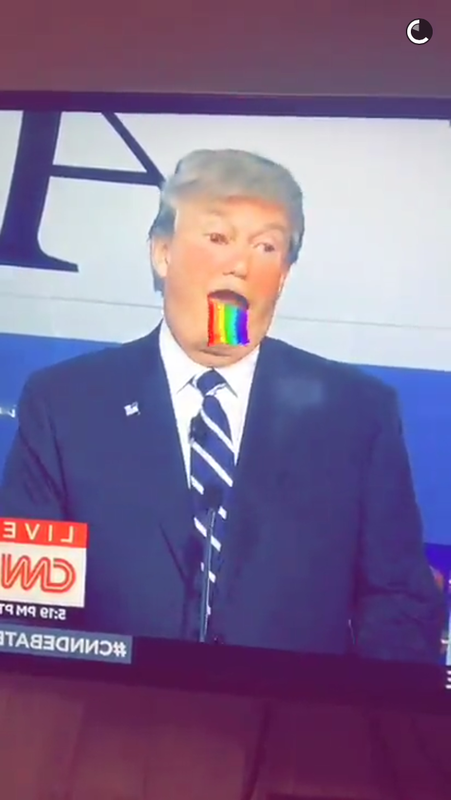 However, I do approve of Daliza’s usage of the filter on Donald Trump. Do you like steady state cardio? What is your favorite form of exercise? Dance or fun calisthenic-type stuff for me. Anything that feels more like playing than working out. Have you ever eaten a whole lobster before? Have you ever felt judged for eating something unhealthy in your workout clothes?